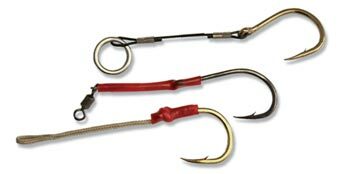 Assist hooks are hooks that are attached to lures with leads typically constructed of multifilament, wire, monofilament or other similar material. Assist hooks have become wildly popular with vertical jigs and are also being increasingly used with plugs in place of traditional treble hooks. Assist hooks or other such single hooks that are attached to a lure with a lead constructed of monofilament, multifilament, wire or other such material must conform to the following: When using assist hooks on any artificial lure, other than a skirted lure, the lead cannot be more than 1 ½ hook?s length and the bend of the hook may not be more than 4 inches (101 mm), whichever is less, from the closest point of attachment on the lure. Double and treble hooks may not be used as assist hooks. IGFA believes that this new language will make it easier for anglers to understand and comply with rules regarding assist hooks. In addition, it also helps facilitate their use with plugs, which are far less damaging to fish than traditional double and treble hooks. To view the complete IGFA International Angling Rules, click here.